"War Hammer" Joins the Fray in This New Captain America: Civil War Art—Wait, Who? 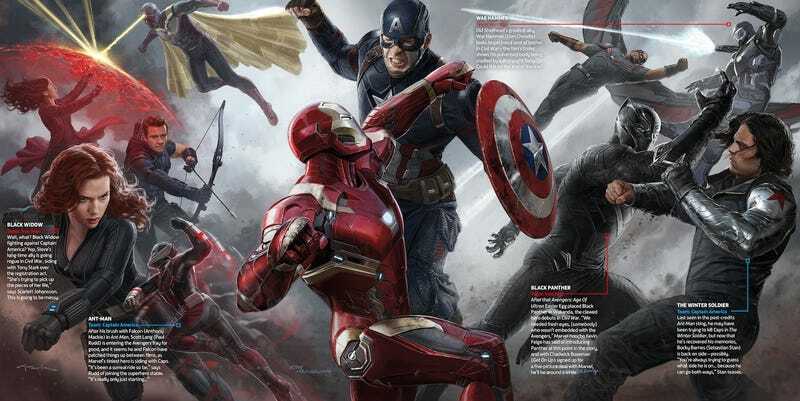 A new promo piece for Marvel’s upcoming Captain America: Civil War is here. It features separate groups of the Avengers, led by Steve Rogers’ Cap and Tony Stark’s Iron Man, just civil warring the hell out of each other. But who’s that in the upper-right corner? While it’s possible that the character has had his moniker changed for the film—he was, after all, the Iron Patriot for a bit in Iron Man 3—personally I’m thinking it’s more likely that this is just a typo on Total Film’s part, and Rhodey will be performing War Machine business as usual.